Today I'll explain how to connect to MS-SQL database using LINQ to SQL classes in Visual Studio 2010. If you building application that will work closely to database, will not only read, but also update the data on SQL server than LINQ to SQL will be extremely comfortable and fast way to work with. 2. Check LINQ to SQL classes. Visual Studio will generate dbml file for you. 4. 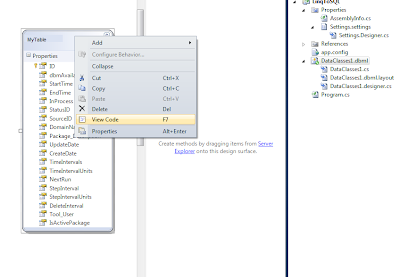 Once connected to a database you can pick any table or stored procedure and just drag and drop it to the Object Relational Designer. This is it! You now actually may start work with your database. 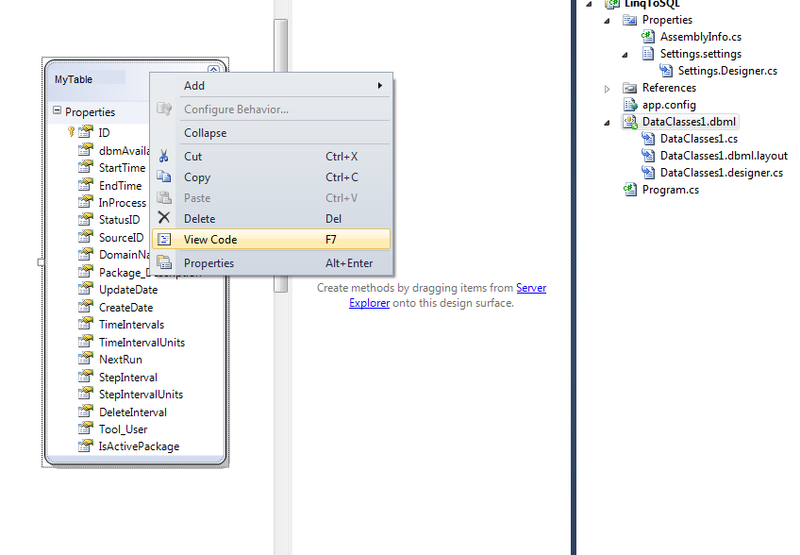 Once you done it Visual Studio will generate DataClasses1.cs file. You can add there your own properties or methods. Ok, now let's see how we can access and work with our database through the code. LINQ to SQL is a very comfortable approach to work with SQL database when you constantly need to update, insert and display the data. However, if all you need is to run an SQL script on database in C# code then I suggest to look at this post - SQL Connection in C# using SqlConnection. You may also find interesting my recent article about newer ADO.NET approach of LINQ to SQL called Entity Framework - C# Entity Framework in Visual Studio 2010.